There is a good reason why people in general tend to eat a little more than necessary in their dinner time. A little lard is always welcome and the few additional helpings always feel comforting. However, the distasteful impact of such tasty everyday escapades has seldom been glorious. With the jiggling belly, thundering thighs and overall stoutness, there practically remains nothing to boast about at the end of the last meal of your day. Nevertheless, it is never too late to introduce changes in your plate and benefit from it at the same time. Shifting to smart dinners that the full with the sources of all vital nutrients while adding minimal calories and eliminating bad fats can be named as the solution. In the process, it is not necessary to compromise on flavors or even the impact of fullness that your gut experiences after a hearty dinner. These 5 effortless dinner options can be considered as a hint to assembling a filling, low calorie and tasteful plate. You can however, introduce your touch of introduction / innovation and enjoy something completely different and something worthwhile that you will not just benefit from but cherish as well as your own creation! 1) Chunky Chicken Soup With Veggies – Chicken soup is well understood in all kitchens. Make the soup while maintaining the chicken chunks as per daily protein requirement. Eliminate all MSGs / cream or other such lard loading factors while piling up on the seasoning with fresh / dried herbs. Steam veggies of your choice and add to the soup and eat it as side dish. East a slice of whole wheat toasted bread for good carbs. 2) Whole Wheat Turkey Sandwich – Two slices of whole wheat bread, 3 ounces of lean turkey slab seasoned and roasted to your liking and steamed veggies of your choice as side dish will complete your requirement of protein, carbohydrate and essential nutrients for the night while keeping the calories within 500 calories. 3) Lean Meat / Tofu spaghetti – Boil spaghetti and season with olive oil and herbs. Throw in chunks of roasted chicken / tofu to the lot. You can also add edamame while maintaining a dash of colored pepper to the plate. Adding a piece of whole wheat bread would complete the dinner. 4) Roast Fish with Lime and Veggies – A slab of fish roasted with seasoning to your liking, with steamed vegetables and a dash of lime – a bowlful of pasta with a dash of cheese will make a complete, nutritious meal with acceptable calories. 5) Lean Pork with Baked Potatoes – Roast pork with your choice of seasoning and serve on your plate with potatoes baked with skin. This will not just be filling but complete at the same time. 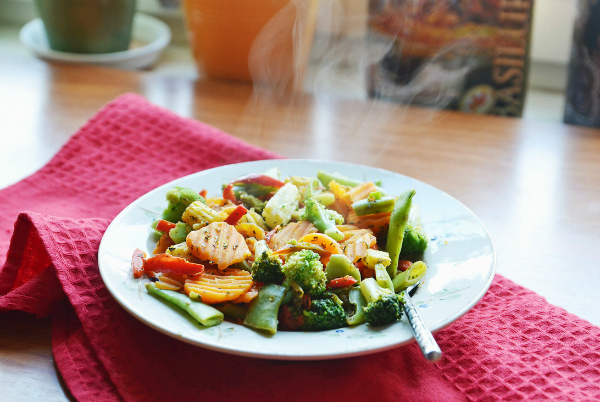 You can add a bowlful of veggies, preferably steamed. In each of these options, you can have the seasoning of the protein options and chopping of the vegetables for the next couple of days done before hand. This is sure to cut down on the time taken to prepare your meal as well.